The Norwegian Pearl is perfect for "freestyle cruising" concept. The Norwegian Pearl is a beautiful ship, with contemporary decor. The cruise ship has multiple restaurants of varied cuisines, lively bars and lounges, interesting activities ranging from quiet corners to the industry's first bowling alley, and family-friendly cabins of all sizes and prices. I attended the naming ceremony for the Norwegian Pearl in December 2006 and then cruised on her for two nights and a day on a cruise to "nowhere". I took many pictures, and this article is based on that short cruise. Number of Restaurants: 12, along with 24-hour room service for all cabins. Villas, suites, and penthouse passengers also have butler and concierge service. Let's take a detailed look at the Norwegian Pearl. The Norwegian Pearl cruise ship has 12 diverse dining venues, and passengers can dine whenever and wherever the mood strikes them. You can even dine in a different restaurant each night! The Norwegian Pearl's restaurants feature tables with open seating for two to ten persons, and the two main restaurants are open between 5:30 and 10:00 pm. The Restaurant Reservation and Management System helps passengers determine which restaurants are busiest and the wait times. This system consists of flat-screen TVs placed in high-traffic areas around the ships and shows each restaurant's availability status. Indicator bars reflect when each restaurant is "full", "short wait", "filling up", or "empty". Screens also show an estimated wait time in each restaurant and the different table sizes available. If you are craving a certain type of food and the restaurant is full, the hostess will give you a wait time and issue a pager that works all over the ship. This allows passengers to relax in a bar until a table is available. Freestyle cruising dress also applies on the Norwegian Pearl, with resort casual the standard attire. Passengers are always welcome to dress up if they wish. Passengers on the Norwegian Pearl do not have to wander far from their cabins to find a bar or lounge. The bars have a variety of concoctions and decor. For example, Bar Central on deck 6 has a beer and whiskey bar, a martini bar, and a champagne and wine bar. The Bliss Ultra-Lounge on deck 7 is Norwegian Pearl's sports bar by day, featuring the first bowling alleys at sea and sports action on multiple flat screen TVs. By night, Bliss transforms into a high-energy disco, with hip music and a lively dance floor. The seating in Bliss is velvety and comfortable--just divine! The Spinnaker Observation Lounge on deck 13 has spectacular views, a dance floor, some really interesting seating, and a stage for entertainment. The Sky High Bar and Topsiders Bar next to the pool offer views of the pool and deck areas, and Mambo's Bar overlooks the Crystal Atrium. Those looking for a specialty coffee need look no further than the ​Java Cafe in the Atrium, and gamblers can stay close to the casino in the spacious Casino Bar. The Norwegian Pearl has a wide range of cabins, and introduces a new concept in mega-ship accommodations--a "ship within a ship". Upscale passengers who expect large, luxurious suites can book one of the spectacular garden villas, courtyard villas, or deluxe owner's suites. Passengers in these amazing accommodations have keycard access to their decks and butler and concierge service. They can eat all their meals in the privacy of the suites; sun, swim or soak in their own pools; and still venture out to go to the shows, lounges, casino, or other "big ship" amenities as they choose. What a life! The Norwegian Pearl also has many traditional cabin categories including inside cabins, oceanview, and balcony suites. The ship also has many connecting cabins of all grades, which are perfect for family groups. These 60 pictures of the cabins and suites on the Norwegian Pearl should give you a good idea of the different types of accommodations. 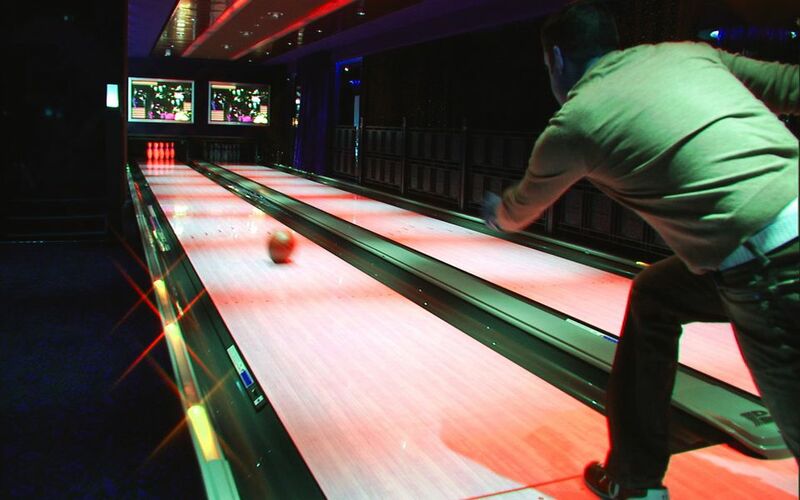 Let's start with the industry's first bowling alley at sea. This four-lane, 10-pin alley promises to be a big hit, based on our short cruise. The Bliss Ultra-Lounge, the location of the bowling alley, has many TVs for sports watching by day and music video watching by night. Bowling is one of those multi-generational activities that passengers of mixed talents can bowl together and have a great time. We had smooth seas on our cruise, so we didn't get to see how much the wave action would affect the bowling scores. It certainly would not have hurt mine! The Norwegian Pearl features the cruise line's first rock climbing wall. Located at the back of the ship's funnel, the wall stands 30 feet high and is 19 feet wide, with 5 different vertical courses, each of varying difficulty. For those looking for indoor exercise, the Norwegian Pearl's fitness center on deck 12 has floor to ceiling windows and many of the latest workout machines. You can work out and enjoy the seascapes! The ship also has exercise classes and a Sports Deck with a basketball, volleyball, and paddle tennis court. The Sports Deck has two life-size outdoor chess boards, two golf driving nets, deck games, shuffleboard, and a walking/jogging track. After exercising, passengers can check out the numerous boutiques located on deck 7 or the casino of deck 6. Alternatively, passengers can enjoy the hot tubs, the swimming pool, or the delightful sunbeds on the pool deck. There is always something to keep you busy on the Norwegian Pearl, but only if you wish. After participating in all the activities described on the previous page, passengers might want to visit the Norwegian Pearl's South Pacific Spa and Beauty Salon for a relaxing treatment or massage. Mandara operates the Norwegian Pearl spa, which features 20 treatment rooms, 3 of which are designed for couples. The spa offers all the standard spa treatments and amenities. The unisex salon includes hair and nail treatments and barbering services. The Norwegian Pearl spa has Norwegian's first thalassotherapy pool, which combines heat and saltwater for a delightfully relaxing soak. The spa also has separate men and women's sauna, steam room, plunge bath, and hot tub. The unisex relaxation area includes a Hydro-bath and the wonderful heated thermal benches seen in this photo. The Norwegian Pearl has most of the technology you would expect from a brand-new cruise ship. I was a little disappointed that the Wireless Internet did not work in the cabin, but the Internet hook-up (don't forget to bring your own standard network cable) worked great. The hookup is a little difficult to locate but is in the cabinet near the TV. Wireless Internet access is available in many of the common areas, although it seemed much slower than the network connection. Passengers not wanting to bring their own laptops can rent one on the ship or use the Internet Cafe. Like most cruise ships, Internet charges are high, ranging from 40 cents per minute to 75 cents per minute, depending on the plan purchased. Passengers on the Norwegian Pearl can also use their personal cell phones on the ship and be billed by their own carrier at the roaming rate set by the carrier. For digital photography fans who don't want to wait until they get home to print pictures, the Norwegian Pearl has a photo gallery with kiosk available to instantly print photos just like at home. In addition to the participatory activities on the Norwegian Pearl, the cruise ship has some excellent onboard entertainment. The first is the famed improvisational comedy troupe The Second City. This ensemble group performs one night each sailing and also hosts onboard workshops for children and adults. The kids' workshops focus on the important principles of improvisation such as listening to others and working as a team. Jean Ann Ryan Productions is in charge of the stage shows in the Stardust Theater. We saw two of the shows on our short cruise. The first was a high-energy show called "Tubez" which featured specialty performers on bikes, skateboards, and in-line skates. The music is pop and hip-hop and was a little young for my taste, but I'll bet the under-30 age group will enjoy it. I don't know how the bike and skateboard tricks will work in rough seas, but they were impressive on our cruise. The second show we had was called "Sea Legs", and is a stage revue featuring ​girls in fabulous costumes similar to what you see in Las Vegas. This show also included two excellent gymnasts (a man and a woman) who performed high over the stage. This show was more to my liking, although I'll have to admit I was very jealous of the fantastic bodies of the young showgirls. The third Jean Ann Ryan show is called "Garden of the Geisha", which features martial arts, Tai Chi, and Kabuki action, all woven into an Oriental love story and performed to the sounds of drums. The large Spinnaker Observation Lounge also has live performances and dancing in the evening. Some nights have themed parties such as rock and roll, disco, or country and western, which sound like a lot of fun. In addition to the many diverse "freestyle" dining options, entertainment and activities, the Norwegian Pearl has many other features that make it family-friendly. The first (and most expensive) are the large suites with more than one bedroom, which are perfect for family groups. The largest suites total almost 4,400 square feet! Norwegian Cruise Line also increased the number of connecting rooms in all cabin categories on the Norwegian Pearl, which is attractive to many families. You can purchase multiple connecting cabins and/or suites, with 2, 3, 4, or 5 bedrooms (and baths). The ship has a large "Kid's Crew" area on the Norwegian Pearl called the Aqua Kid's Club. This educational and entertaining program is available to kids from 2 to 17 and is offered year-round on sea days and in the evenings when the ship is in port. In addition to the kids' program, the Norwegian Pearl has a group sitting service for ages 2 and up from 10 pm to 1 am and for certain hours when the ship is in port. Parents need time to have fun, too! Parents may want to purchase a Kid's Crew backpack package for their kids that include a baseball cap, sunglasses, luggage tags, t-shirt, souvenir cup, and unlimited sodas for the entire cruise. The backpack sells for $39.50 on seven-day cruises. The Kid's Soda package, which includes a cup, telescopic straw, and unlimited fountain sodas has an extra fee, but might be worth it if your kid loves soft drinks. Teenagers will love the Teen Metro Center, which is a teen-only theme club complete with large TV, disco, theme parties, and an arcade. Teens can purchase a "teen passport", which gives them a coupon book for $34.50 that they can use towards non-alcoholic specialty drinks, pizza parties, and a farewell party. Families should love the cabins, activities, and programs on the ship. In the fall, winter, and spring months, the Norwegian Pearl sails Caribbean itineraries round trip out of Miami. In the late fall 2017. the cruise ship will sail to the Caribbean from her new homeport of Miami. The Norwegian Pearl repositions to Alaska in the summertime, where she sails a seven-day Alaska Inside Passage itinerary out of Seattle with calls in Juneau, Skagway, Ketchikan, and Victoria. In the fall and spring, the Norwegian Pearl sails a repositioning cruise through the Panama Canal. In summary, this mega-ship seems to have something for everyone. Lots of action, beautiful cabins, and a variety of food, drinks, and entertainment.